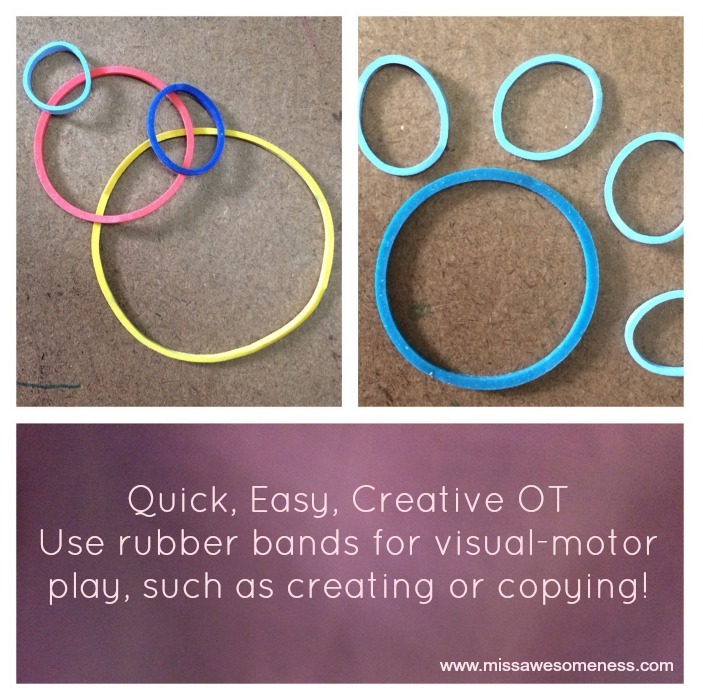 Use rubber bands to work on visual-motor skills! This can be fun and imaginative and a great idea when your options are limited. You can have the child “create” something such as the dog paw seen above on the right, or you can have the child “copy” something! You can focus on figure-ground, spatial orientation, creativity, spatial language (is the blue band under or on top of the red band? ), etc! Try to keep this activity play-based. Maybe the bands are actually “bubbles” or you’re giving the dog paw a high-five by placing another dog paw directly on top, whatever. The task can be the same, but the language/drama surrounding it can turn it into play!